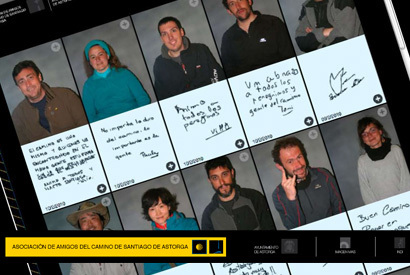 The Amigos del Camino de Santiago Association of Astorga, with the collaboration of the Town Council, carries out this project with the aim of leaving a mark of the numerous pilgrims who spend the night in its Hostel in the Jacobean Holy Year 2010. 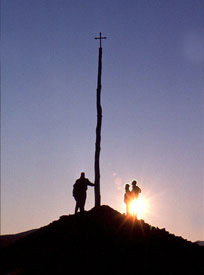 Pilgrims participation will be voluntary and altruistic. All the photographs are taken with the same camera- switched by the pilgrim pressing on a key – and the text is written by means of informatic tools. The photographs and texts are uploaded to the web site in real time and are automatically arranged by date. 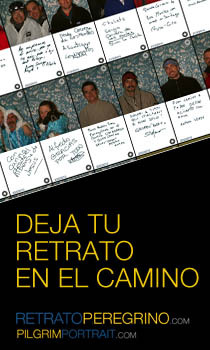 The camera is placed in one of the rooms of the public hostel of Astorga until the 31st of December, 2010. The formula of the project is an idea of Imagen Mas and the design and development are by indi.es. The promotion and the economic financing will be met by the Amigos de Santiago Association and the Town Council of Astorga. All rights reserved. Prohibited the total or partial reproduction of photographs, texts and various elements of the Web Site without the express consent of the owners of each.